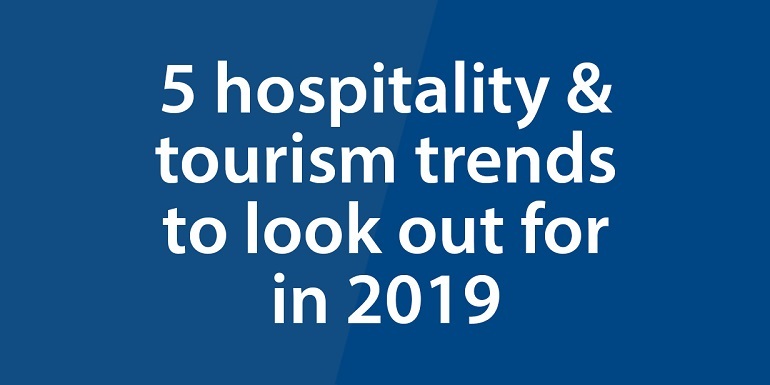 In 2019, we'll see even more people travelling and visiting different places around the world, but what trends will affect the hospitality and tourism industries? Find out by looking at the five below. The integration of voice technology or Interactive Voice Renegotiation (IVR) in the hospitality industry may still be in its early stages, however that hasn't stopped hotels from exploring the possibilities of the technology. Hotels are looking at utilising smart speakers and allowing guests to make simple voice commands to make requests. Food and beverage innovations are mostly being influenced by millennials, who are blurring the lines between formal and casual dining; they want quality food at affordable prices. Diners want experiences when they eat, open-fire cooking and visually pleasing dishes that are Instagrammable - that's what young travellers want. Guests are becoming accustomed to a personalised service - starting from the booking stage to when they reach their desired destination. From the apps or websites to hotel room, the industry has started to base customer preferences on previously selected information and a customer's history. In this way travellers get a truly customised service. Travel businesses are being urged to cater to a growing 'wellness' holiday trend. Wellness resorts and healthy holidays are big business in the tourism industry with many travellers immersing themselves in the culture, tranquillity and health benefits related to the destinations they visit. With the influence of low-cost airlines and more routes, travellers have more accessibility and choice. In 2019, travellers are becoming more aware of 'overtourism' and so are opting to fly to locations at off-peak times or fly to smaller, less popular locations all together.